On Thursday, April 23, four branch members helped at the refreshment table for the Herb Festival of the Women’s Resource Center in Alamance County. This is a major fundraiser that supports the work of the WRC, dedicated to helping women and their families improve and enrich their lives. Its main program is “New Choices” which serves displaced homemakers. Branch member Becky Mock is the center’s program director. Pictured are Jenna Johnson, Caroline Novello, Doris Bernlohr, and Becky. 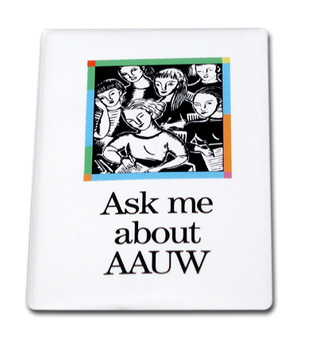 Note the “Ask me about AAUW” buttons that got the branch a bit of visibility at this event. We have more buttons for any members who want to do a similar project in their community. This entry was posted in News and tagged pix, programs. Bookmark the permalink. The Women’s Resource Center in Alamance County greatly appreciates the help of our AAUW members with the kick-off of the 12th Annual Herb Festival.